Today I welcome L. A. Ashton to the blog to answer a few questions for Author Interview³. I obsessively wrote vampire fiction in junior high. When I was six, I wrote very bad poetry with very bad accompanying illustrations. There was one dedicated to Pepsi. The plot for Valhalla was almost entirely imagined while listening to a single song ("Kassai to Gekijou no Gloria" by Matenrou Opera). They change all the time! I love 1984 and The Poisonwood Bible when I’m feeling “literary”, but if I want to have a really great time I’ll read Dalí (E. M. Hamill) or Carry On (Rainbow Rowell) again. I write at my desk at home, but I would love to write in a cabin tucked away in the mountains, or in a sunroom filled with light and plants. I really want to try writing horror! I’ve always wanted to write a piece that blends space and sorcery. I wrote a divergent history novel AGES ago, and I want to turn it into something great. You gotta write. A lot. Find someone who truly cares about you to be a critique partner. You have to be able to trust them when they love it, and when they don’t. Don’t lose sight of why you started writing in the first place. I have two contracts other than Valhalla scheduled for release this year. I also plan to finish my current WIP and query my most recently finished novel to agents. 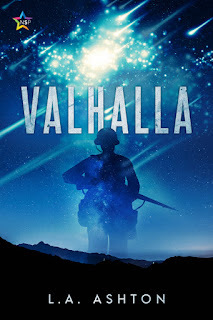 Valhalla is the answer to a question I was asking myself. With eternity as a backdrop, what is truly important? What really matters in the scheme of things? A valkyrie is met with a soldier who is unwilling to die, even with a grand afterlife promised to him. Together—and separately—they must decide what life and humanity mean to them. Sakuma has served as a Valkyrie for centuries, smoothly escorting thousands of souls to the grand halls of Valhalla. While the world tears itself apart during WWII, he is summoned to retrieve the soul of a fallen Japanese soldier, Ishii Hiroshi. To Sakuma's surprise, Ishii refuses his invitation to eternity. L. A. Ashton is an LGBT+ author writing LGBT+ fiction. They were born and raised between neat grids of corn and soybean fields. They enjoy rock music, traveling, and anything else that adds color to their daydreams. They believe in the healing properties of art and of having a cat firmly stationed on one's lap.